For the summer of 2017, I ventured into the world of street portraiture in the historic center of Quebec City; which remains one of the best spots in North America for that trade. Here are some lessons I have learned from my first month drawing strangers on the street. 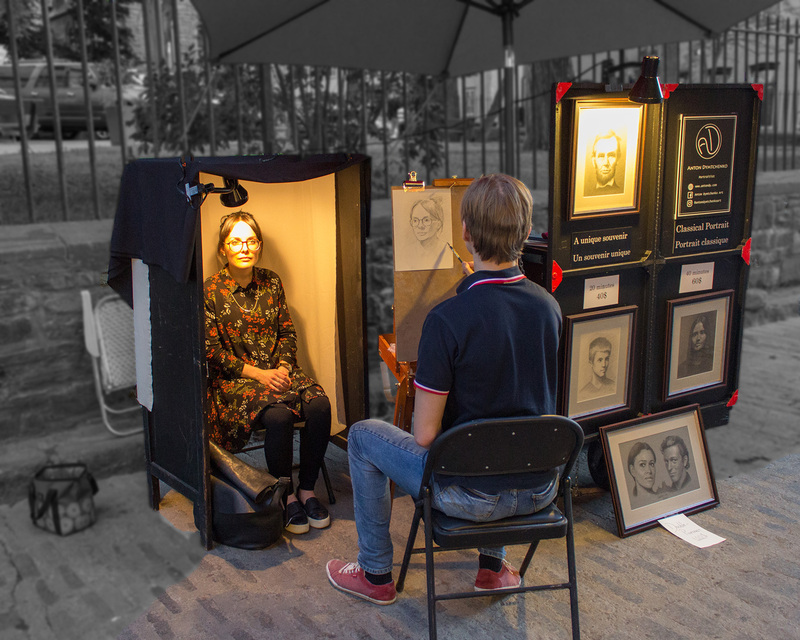 As a street portrait artist, you’re selling a product that does not exist yet. Hence, passersby need even more persuasion to engage with your trade. Everything about you will influence your performance: your mood, your posture, your expression, your clothes, your approach, etc. All those features are mostly irrelevant in a studio setting but they become quite important in a public set-up. Of course, it is essential to remember that the quality of your work must be the main source of attraction. Unfortunately, most people are not art critics or draughtsmen who will recognise your confidence in every pencil stroke so a wave of charisma is often needed to push clients gently on the model’s chair. The expression “you’re on a roll” can apply remarkably to street portraiture. The more you draw people, the more other people will see you working, the more clients you’ll have. A friend posing for you in the morning, to start off the day, or at night to inspire some clients for the next morning, is a fruitful plan. The same logic applies when passers see a packed restaurant or a sold-out concert. They don’t know much about it, but if people are there, there must be something to it. So, in the timeless words Rihanna didn’t write herself: “There’s something ’bout that work, work, work, work, work”. As you’re waiting for clients and hours go by, the mind is very eager to jump in the what-am-I-doing-wrong whirlpool. Free time might be convenient to think about what you should improve in your set-up or what groceries you forgot to buy, but it can go downhill easily. Moreover, the wrecking ball of reality quickly smashes any harmless expectation. 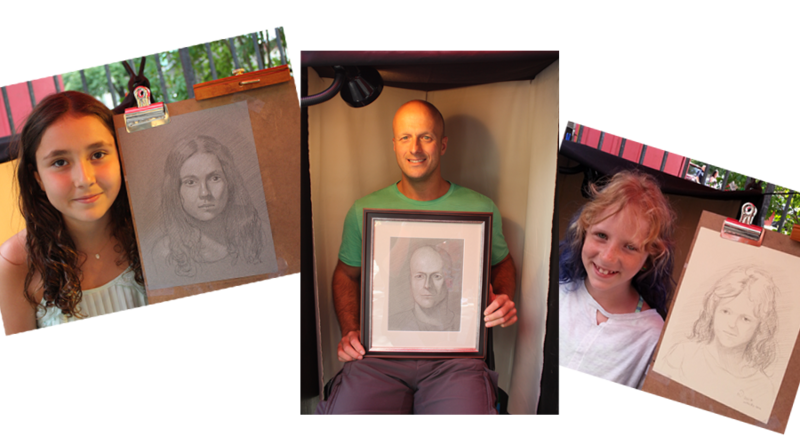 It’s always useful to have a portrait-related personal project to work on during such times like a photo commission or a great master’s reproduction. Passers will be more interested in your enterprise if they see you working. And if you’re taking a break, just enjoy sitting outside in the summer breeze. As many wise men have said: keep in tune with the Universe, don’t judge the situation and what has to happen will happen. For succeeding on the street, there is sound advice but no magic recipe. Some clients will approach you directly; some you will have to “reel in”. Some clients will decide right away; some will take a day or two to think. Some clients will be convinced by your displayed work; some will be convinced by seeing you in action.